Jonathan Latiano will speak about his artwork and his teaching experience. Jonathan Latiano (born 1982) received his BA in Studio Art from Moravian College in Bethlehem, Pennsylvania in 2006 and his MFA from the Mount Royal School of Interdisciplinary Art at the Maryland Institute College of Art in 2012. Jonathan’s artistic practice is rooted in the study of time, the natural sciences, and the viewer’s own spatial awareness within the immersive installations he creates. 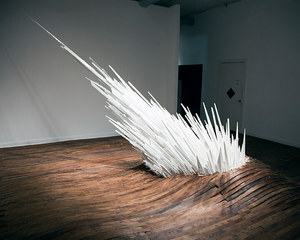 His artwork has been exhibited in numerous solo and group public art exhibitions in cities including New York, Philadelphia, Baltimore, Washington DC, and London, and his work has been featured in local, national, and international art publications. 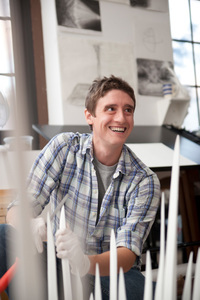 Jonathan was the recipient of the 2013 Mary Sawyers Baker Prize in Art, Moravian College’s Outstanding Young Alumni Award, and the Bunting Teaching Fellowship in Fine Arts at the Maryland Institute College of Art. Jonathan currently resides and works in Baltimore, Maryland and teaches at the Maryland Institute College of Art and the Corcoran School of the Arts and Design at George Washington University.